A nine-strong “senior” team from the SANDF Reserve Force brought home the bacon from the recent CIOR (Inter Allied Confederation of Reserve Officers) International Military Skills competition. 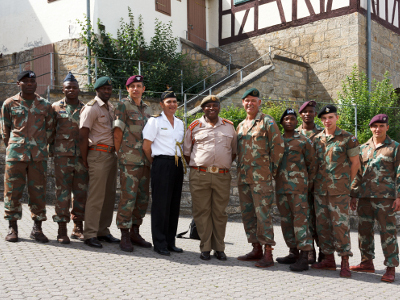 The South African team travelled to Hammelburg, Germany, to take part in the “experienced” category and finished first ahead of mainly NATO countries. “The competition evaluates the many and varied skills soldiers need to be combat ready,” team leader Lieutenant Colonel Uys van der Westhuijzen said. Skills put to the test by CIOR instructors were tactical combat casualty care in a simulated environment, pistol and rifle shooting, crossing land and water obstacles as well as an orienteering march over varying terrain and conditions. The march included map reading, distance estimation and grenade throwing, among others. “Making it even more challenging is that the different shooting events have to be completed within set times, the obstacle crossings and the orienteering march in a short a time as possible and all of it done in combat uniform with webbing,” Van der Westhuijzen said. The South Africans competed against 23 other team and won, for the first time, the “experienced” category. Apart from Van der Westhuijzen and coach Captain le Roux, who represented the Infantry Formation along with Major Labuschagne and riflemen Mdlalose and Smit the rest of the team was Lieutenant Du Toit, Corporal Hlope, Trooper Ngidi (all Armour) and Captain Ditshego (SAAF). “Our team proved we are indeed fit and ready when measured against international standards,” Van der Westhuijzen said adding the support from Defence Reserves Division, Reserve Force Council, SA Army Force Preparation and unit commanders contributed in no small measure. “They all realise the need for and importance of our soldiers being exposed and evaluated against international standards to assess, evaluate and improve combat skills,” he said.